This was a game based on the supposition that the Germans had landed in southern England and joined up with the parachutists Fallschirmjager dropped south of the Thames. As a ‘Fantasy’ game, this did not preclude the appearance of a certain Local Defence Volunteer platoon from Warmington-on Sea! The British, composed of a platoon of Regulars, supported by the local LDF platoon, a Matilda 2 and 3 Vickers Mk 6 light tanks and a 2 pdr A/T gun, deployed along a river bank near a ruined abbey. 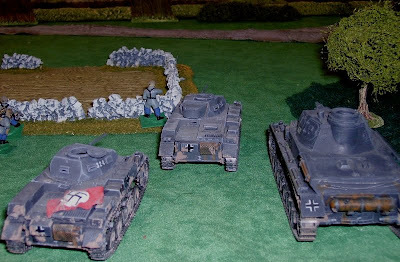 The Germans, composed if a platoon of Panzer grenadiers with a heavy platoon of tanks, flanked by a group of about 20 Fallschirmjager appeared on the opposite edge of the table, tasked with brushing aside the British and exiting the other table edge. The Germans moved rapidly to cross the river leaving their panzers in reserve. 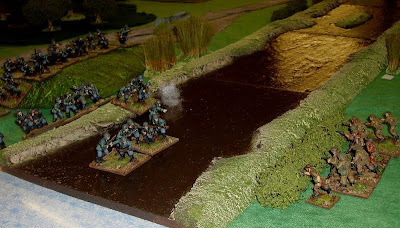 On the right, the panzer grenadiers moved over and around a small hill, but failed to spot the waiting British regulars on the riverbank. 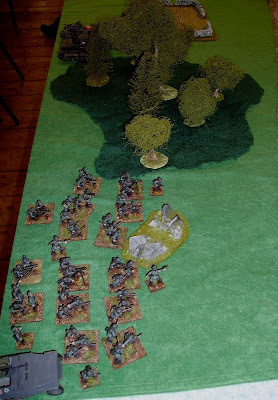 The British opened fire on the grenadiers when they were in the stream, but failed to cause any casualties, the returning fire from the hill drove the British back in disorder taking their wounded with them. 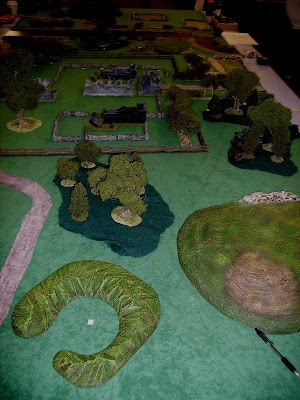 As the Germans began to outflank the retreating British they were forced to take cover behind the hidden LDV platoon. One could almost hear a Scottish private whispering ‘ Whear aall doomed!’. Seeing this the portly captain of the LDF trotted back to summon the tanks to their aid. His short legs would not be able to save the day though, as events were to prove! 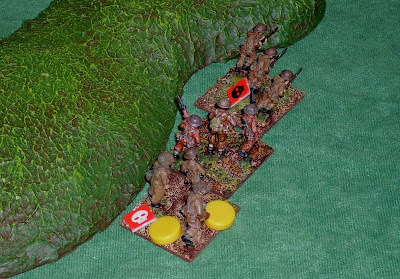 On the German left, the Fallschirmjager moved forward, but failed to spot the infantry in cover facing them. 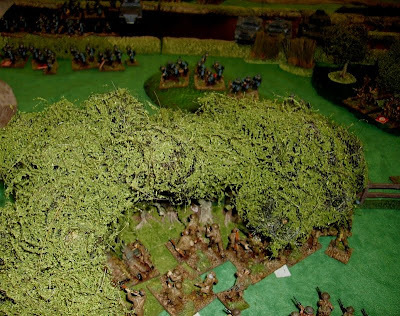 A sniper on their right did however, and smartly disposed of the British NCO – the section falling back to the woods behind them. The Panzer Grenadiers swept forward after their easy victory, but were met by accurate fire at short range from the Local volunteers. The Germans were forced to ground and had to fire a flare to summon the Panzers. With the arrival of the Panzers, the Local defence volunteers were forced back from their positions and the Germans pushed round the flank to victory! 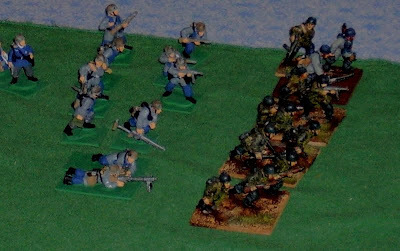 In the end, all the players were glad Operation Seelowe did not take place for real. On the basis of this game we felt that in 1940, Britain would have had little chance. At least, in Wargames, all the dead guys get up in the end! -War without tears.